Hello friends!! 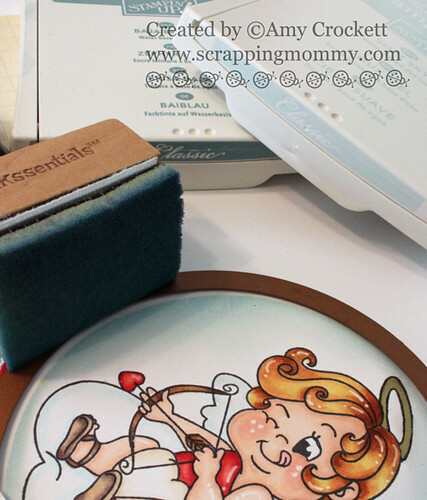 I have a new post to share with you here today as well as on the Peachy Keen Stamps Blog. It is my first as a new 2012 design team member. WooHoo!! 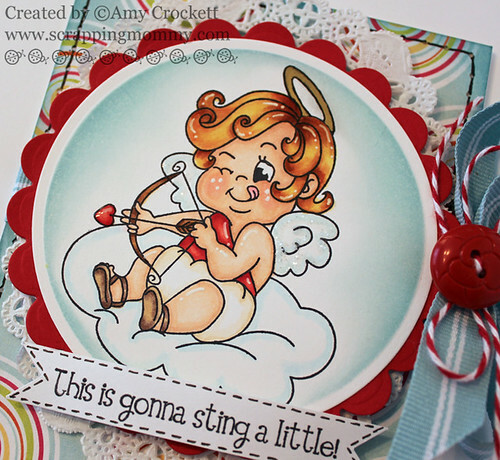 I just love Valentine's Day and this adorable Cupid's Sting image from Peachy Keen Stamps is so fun color with Copic markers. Isn't his expression fabulous?!? I added some white gel pen accents to the colored image and a gold colored paint pen to color in the halo as well as some glossy accents to the heart on the arrow. I then cut it out with my Large Circle Nestabilities set. I also embossed the edges with my Nestabilites in my Cuttlebug and then added some blue ink with my ink blending tool and two shades of blue. I used the lighter one first and moved in closer to the image and then with the darker color, I just stayed closer to the outside making sure to blend it all together again with the lighter color. I finished it all up with some ribbon, bakers twine from The Twinery, a button, glitter, a doily, and some pen stitching. 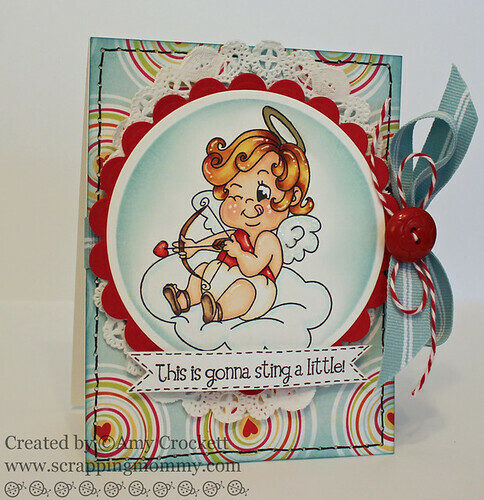 I hope that this has inspired you to get some stamping done for cards to send to loved ones this Valentine's Day!! So CUTE Amy!!! I absolutely LOVE it - as always!!! Great work!